Everyone wants perfectly coiffed brows, and if you are looking for a hair removal method that will leave you with sleek, flawless eyebrows, there is no better option than threading. Threading has been a hair removal technique used in India for centuries, and has gained popularity in the U.S. due to the greater precision it gives the technician. Using a cotton thread, your threading technicians uses a twisting motion to swiftly pull unwanted hairs out. If you have never experienced threading before, you may be feeling intimidated by the process. That’s okay! 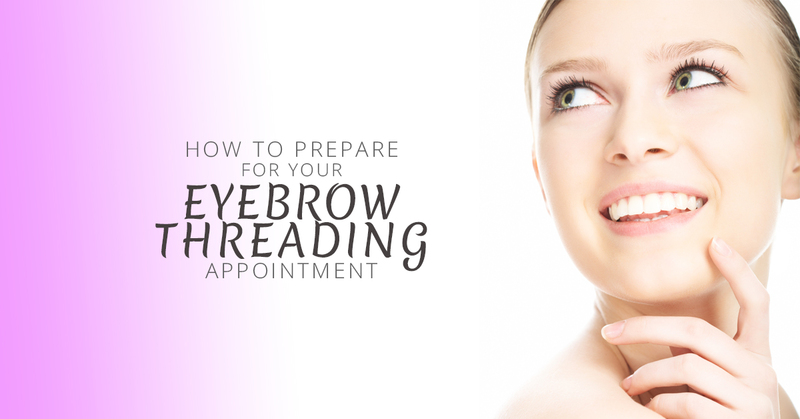 In this blog, we will go over steps you can take to prepare yourself for your eyebrow threading appointment for best results. Before your appointment, it’s important to let your brows grow in. You may be tempted to shape that as you normally do with tweezers, but it is best to let them go natural for at least two weeks before your first threading appointment. This gives your hair enough time to grow in so the technician can more easily remove the unwanted hairs. Your technician can’t read your mind. If you tell them you just want to “clean up” your brows, or worse, not saying anything at all, we won’t know exactly what shape you desire. Have an idea about what exactly you want before your appointment, and we can help you determine what shape would best flatter your face as well. Consider how high or sharp you would like your arch to be, as well as how thick you would like your brows to be, so we don’t have to guess when you come in. Before your eyebrow threading service, don’t apply any eye makeup. This is because while threading isn’t very painful, it often causes your eyes to tear up. Additionally, your makeup will probably be naturally smudged over time. Skip the mascara for the day so you don’t have to walk out of the salon with racoon eyes. While it shouldn’t be as severe as when you are waxed, it’s typical for there to be redness after threading. We will offer you a couple of different products to help you ease your redness, including aloe vera. If you have especially sensitive skin, you may consider bringing Neosporin with you to help your skin calm down after your threading appointment. Due to the redness, you may want to put concealers, foundation, or other makeup products on your brows, but it is best to avoid this. Your pores are still open for about two hours afterwards, leaving them susceptible to bacteria. Leave the area alone for a couple of hours after your appointment to ensure you don’t get an infection. To maintain your clean brows after your appointment, you will want to go ahead and schedule your next appointment for two weeks later. By having your brows threaded every two weeks, you can keep them looking sharp and neat. One trick for making sure that your threading appointment isn’t horribly painful is making sure that your skin is properly hydrated. Dry skin is more sensitive, making the process more painful. Hydrate by making sure you drink plenty of water the day of your appointment so your skin is as moisturized as possible (without using a moisturizer). You may be nervous about the discomfort that comes with threading, but it’s best to relax and breathe during your appointment. Don’t tense up, as this will only add to the pain. If you can just relax, it will be over before you even know it. Prepare for the Best Brows Ever! Most of the time, people who receive threading for the first time are shocked by how neat and shaped their brows look with this new technique, particularly if they have naturally sparse or wild brows. Your freshly coiffed eyebrows will not only look clean, but totally natural-looking, which will flatter your face in a way you may not have expected. Once you have your eyebrows threaded, prepare to love the results, and be totally hooked on the process! If you want to thread your eyebrows in Chelsea, your best bet is Unique Threading Salon. With years of experience in hair removal, we can make your brows look pristine with our threading services. Contact us today to schedule an appointment!